There is a point in a potter’s journey with clay when it is time to rise to greater challenges in skill and creativity. 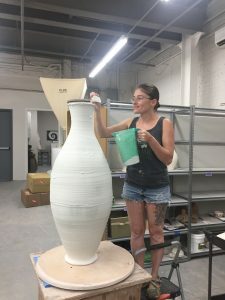 For Tori Motyl, an amazing, contemporary potter, that time is now. She is skilled and she knows her aesthetic. 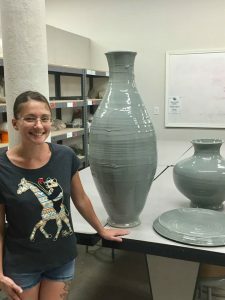 So when she signed up for my class, BIG: Throwing Large Pots, I knew that she would make something stunning. Finishing well is critical in all areas of life, and this is truly the case in the final details of making pots. In a matter of seconds, you can completely destroy your best work in the glazing process. These two brief videos give you a glimpse of the strategic choreography of the dance involved while glazing Tori’s Big pot. We rehearsed our plan, and then with me on a ladder behind the camera, you will see Tori and her team, Clive Earnhart (fellow BIG student) and Julia Mann (Resident Village Potter and BIG student) getting it done with finesse.